Free hot breakfast free parking an outdoor pool and downtown San Jose seven miles away satisfies our guests at the non-smoking Hyatt House San Jose/Silicon Valley. 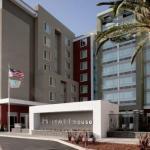 The seven-floor Hyatt House San Jose/Silicon Valleyhas 164 rooms studios one- and two-bedroom suites. Designed in a residential style the rooms feature Wi-Fi access flat-panel TVs with premium cable iPod docks luxury toiletries and plush beds with pillowtop mattresses and cotton-rich sheets. All suites have full kitchens and sitting areas with sofas and some have sofa beds. The free hot breakfast has a rotating menu of cooked-to-order omelets scrambled eggs bacon sausage waffles pancakes French toast and more. Take a lap around the heated outdoor pool. The hotel also has a fire pit outdoor patio business center fitness center laundry facility 24-hour market and lounge. Parking is free. The Sierra is off Highway 237 seven miles northeast of downtown San Jose. If you're driving from Norman Y. Mineta International Airport the hotel is five miles northeast.